Nepal has been hit by the worst earthquake in 80 years that has claimed the lives of over 5000 people and thousands injured. 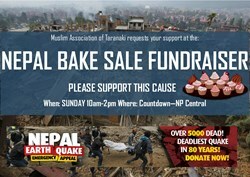 InshaAllah will be hosting a Bake Sale outside New Plymouth Countdown between 10am - 2pm this Sunday (3rd May) to raise funds for the Emergency Earthquake Appeal for Nepal. Please contact us if you're able to help with baking or please comment below. All baked goods are required to be dropped off the night before. Also please support the cause by attending and purchasing.